Individual studio mats with non-slip base and fully washable exterior. These mats are thicker than most mats as their aim is to protect the spine on the many spine-rolling Pilates matwork exercises. They are also very useful for hip problems and are considered the ultimate perfection in comfort. Ballet slippers with a non-slip tread. These are made from cotton and Lycra to aid foot grip on the many balancing Pilates matwork exercises. They are also very useful for keeping the feet warm and preventing slips on sprung studio floors. Premium bags with Pilates print and cord handles. These bags can be used as either a rucksack or shoulder strap style bag to keep your Pilates socks in! An essential bit of kit to hold your belongings as you exercise. One colour - black with white trim and silver print. Latex bands in various strengths and colours. These bands can be used when there is a lack of overall strength flexibility for some of the Pilates matwork exercises. Not recommended for long term use (unless disable) as exercise progression will lead you into independence. Useful for when rehabilitating the spine, hips and knees. The Pilates Principle book is a recreation of the original Pilates moves with comprehensive instructions accompanying quality full colour digital images of each exercise. It has been reviewed and praised for its true Pilates exercises and its simplicity. The results of body shape change, control and well being from exercising the Pilates way are tremendous. A must for enthusiasts. 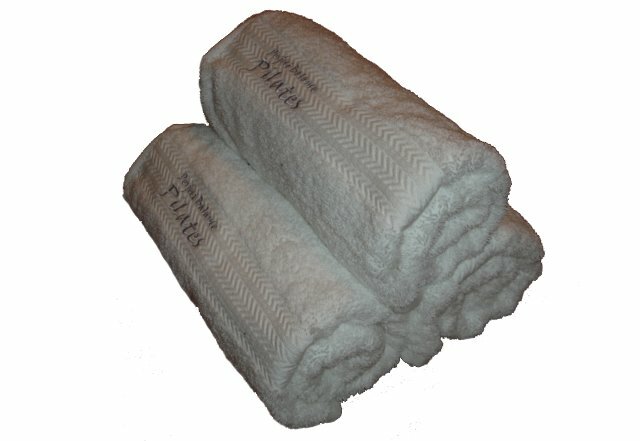 These hand towels have a herringbone style border and are perfect for taking to your Pilates class to wipe your hands with or to use folded as a neck or head rest. 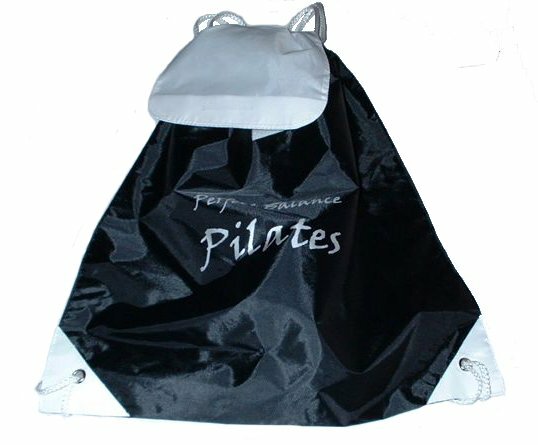 White towels with silver embroidered Pilates logo at both ends. Cotton short sleeved slim fit v-neck or original fit crew neck t-shirts with the Pilates embroidered logo. These are fabulous for doing Pilates in, cool in the summer, cosy in the winter and why not keep a spare in your Pilates bag! Colours available are white, grey or black with silver embroidery. T-shirt, bag, ballet slippers, band and towel. Buying these together saves 15% discount off the combined price. 4 large, 4 medium & 4 small Pilates mats, Pilates instructor T-shirt, Pilates gym bag, Pilates gym towel, 4 Pilates bands and The Pilates Principle book. 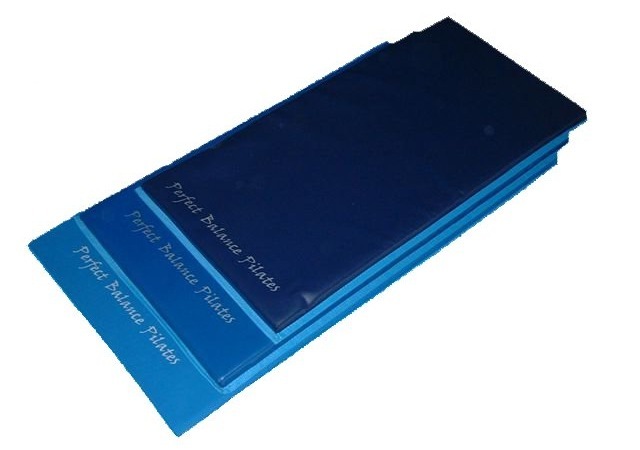 Buying these together saves 12% discount off the combined price..
20 foam mats (100cm x 50cm x 1cm), Pilates Instructor T-shirt, Pilates gym bag, Pilates gym towel, 4 Pilates bands and The Pilates Principle book. Buying these together saves 10% discount off the combined price. 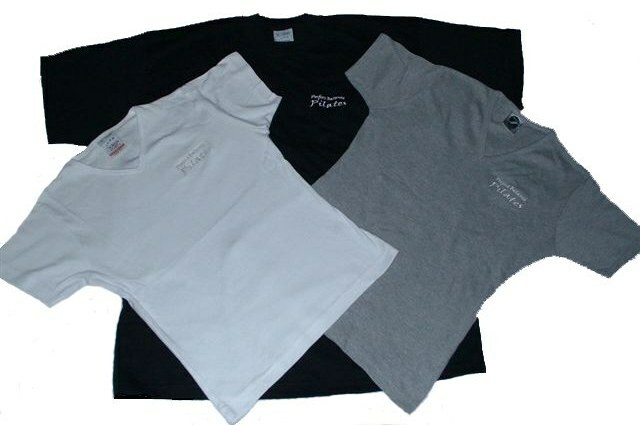 Pilates Instructor T-shirt, Pilates gym bag, Pilates gym towel, 4 Pilates bands and The Pilates Principle book. Basic foam mats to use two at a time for your classes. One size (100cm x 50cm x 1cm) and one colour. Prices are for Mainland UK only, for Overseas rates please e-mail.